Maharaja Aparajita ruled over Sushima town in the Purva Mahavideh area. He was a simple and religious person. He got detached after listening to the discourse of an Arhant and took Diksha from Acharya Pihitashrava. 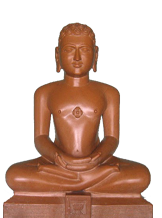 As a result of long spiritual practices he earned Tirthankar-nam-and-gotra-karma. Completing his age, he reincarnated as a god in the Graiveyak dimension. From the dimension of gods, the being that was Aparajit descended into the womb of queen Sushima, wife of the king Kaushambi. One day queen Sushima had a desire to sleep on a bed made up of lotus flowers. As this was a desire of a pregnant mother, the gods made arrangements for its fulfillment. On the twelfth day of the dark half of the month of Kartik the queen gave birth to a son. The new born had a soft pink glow like lotus flowers. The king named him as Padmaprabhu. Prince Padmaprabhu, grew up in all repect. He was married and one day king Dhar was sitting with all the respected members of the kingdom. He announced that from this day onwards Padmprabhu will handle all the responsibilities of the kingdom and he and his wife will lead their lives in spiritual practices. The decision was happily accepted by all. Padmprabhu stood up and said, “I have no desire to become a king . I am just respecting the words of my father. The kingdom is of everybody and not of me alone. I would take only the amount needed for survival and the rest will all be of the people of kingdom”. All were more than happy on this note. Padmprabhu use to perform his duties towards the kingdom very nicely, but now he started spending more time in meditation in a small place near his lotus river. And one fine day while in meditation he attained the entire knowledge of his past incarnations. He saw the reasons why he had to come on earth from heaven and he decided to take diksha and move on the path he has taken birth for. The next morning he stood under a tree, discarded all his worldly things, removed his hair in five fistfuls and recited ‘Namo Sidhanam’. He moved on the way where he could destroy all the Karmas attached with him and preach the world the importance of life, religion and right Karmas. After six months of spiritual practices, on the full moon day of the month of Chaitra he attained omniscience under a banyan tree. Propagating right religion for a long time, Bhagavan Padmaprabhu wandered around and at last arrived at Sammed shikharji. He got Nirvana on the eleventh day of the dark half of the month of Margshirsh.